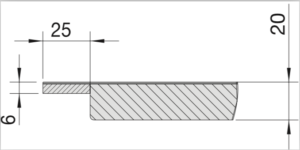 The edge radius of 1 mm is one example of BLANCO SteelArt’s competence in stainless steel. Only our company offers this particular kind of filigree processing. Processing the worktop to the highest standards with exceptionally narrow radii results in a clear, linear effect. The new chamfered edge design “Fase” adds a striking effect to worktops. It even facilitates rounded lines or the rounding of innovative Durinox worktops, and opens up new options in kitchen concepts. It is particularly elegant in combination with a thin worktop. It expressively underscores Blanco’s excellent expertise in the processing of stainless steel. Minimum bredd: 600 mm, maximum bredd: 1200 mm. Minimum längd: 500 mm, maximum längd: 3800 mm.